It is safe to say that most of us have aspired to travel around the world, to see and experience the different places and culture our planet has to offer. Each place offers extraordinary experiences and astonishing stories. One particular famous tourist destination in the Philippines, made the headlines as it is reportedly dangerous to be in its vicinity. But what makes it interesting is that, even though the local government took extreme measures to warn the people to evacuate, tourists and locals alike, still flock around it like a moth to a flame. The Mayon Volcano, an active volcano found in Albay part of the Bicol region, was recently reported to be on the verge of eruption. This leads to placing Albay under a state of calamity, forcing residents near the volcano to evacuate. The Mayon Volcano is the most active volcano in the Philippines, having a record of almost 51 eruptions in 400 years. It has an almost perfect cone shape which makes it the main tourist spot in Albay. Its name, Mayon, was derived from the word, “Magayon”, which in Bicol dialect means ‘beautiful’ in the English language. 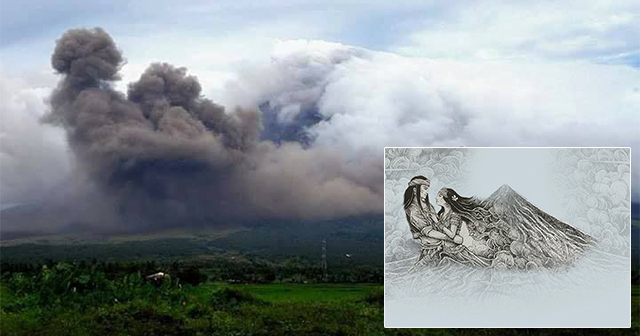 Oddly enough, the recent photos of the Mayon showed ash-like smoke forming two figures embracing together. 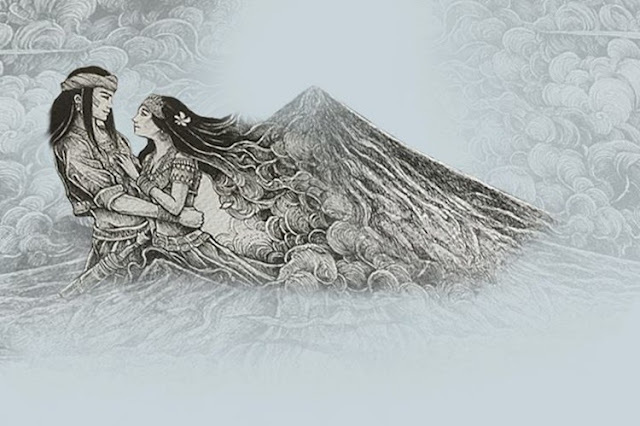 As this was discovered, the romantic story behind the volcano’s name reminds us of a tale of two lovers. The story goes far back when tribes are the basic society of people. 'In a place called Ibalon, lies a powerful tribe headed by their chief, Makusog (the strong one). He has a daughter named, Daragang Mayon (the lovely one) who was the most coveted maiden in their tribe. In one beautiful day, she was crossing the river when she accidentally missteps on a rock and fell in the water. The current instantly carried her downstream as she cried for help. Luckily, Pangaronon (the proud one) and his bodyguard, Amihan (the cold one) heard her and jumped to rescue Daragang Magayon. She thanked them repeatedly for their heroism and offered that as her father was the chieftain of their tribe, they will be thoroughly rewarded. Pangaronon stood dumbstruck, as he was enchanted by Daragang Magayon’s unparalleled beauty. He felt like he found the perfect woman for him, and coincidentally, Daragang Magayon felt that he was the man for her. Pangaronon immediately went to see Daragang Magayon’s father, not for a reward of saving her, but his blessing for his daughter’s hand in marriage. But tribal law made it impossible for them to marry because Pangaronon was not part of their clan. It has torn Makusog that even if he is chieftain, he has to impose the law which resulted in the unhappiness of his beloved daughter. On the other hand, one of Daragang Magayon’s most enthusiastic suitor, Patuga (the eruptive one) found out of Pangaronon’s plan to marry Daragang Magayon. It angered him that he has been courting the chieftain’s daughter for years, yet she chooses a man outside of their clan. One evening, Patuga abducted Makusog and sent word to Daragang Magayon to marry him in exchange for her father’s life. Daragang Magayon, even if it was against her wishes, had to accept for the sake of her father’s life. Shortly, as they were about to be wed, chaos broke out as Pangaronon and his men came, engaging Patuga in a battle, their tribes at war. As bloodshed around them, Pangaronon finally defeated Patuga. But Pangaronon’s victory was short-lived, as a poisonous arrow that came from nowhere, hit Daragang Magayon on her chest. Pangaronon cried out and ran to the dying Daragang Magayon attempting to save her, but an enemy behind him swung his sword, slicing off his head. Pangaronon and Daragang Mayon was the buried and mourned all over the land when a mountain mysteriously appeared as lovely as their Daragang Magayon. Even with this natural phenomenon, the bicolanos could not help but share the legendary story of the majestic Mayon. 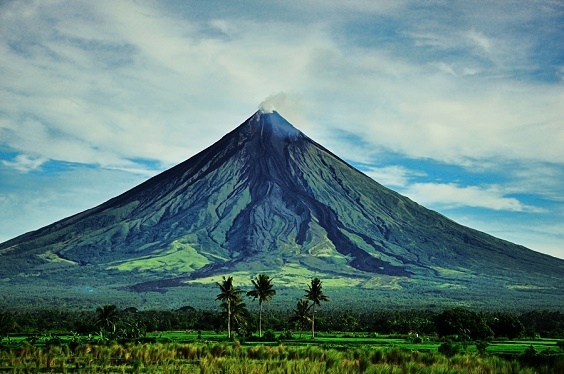 The Mayon volcano is truly a beauty with its symmetrical features, enchanting legends, and rich history. It stands 2,462 meters high, almost like a proud chieftain guarding over Albay, and located 300km southeast of Manila, the capital city of the Philippines. Even though now that it seems to be on the verge of eruption, tourists still come and see the beauty that is Mayon. It is like beauty and fury, stunningly beautiful yet extremely dangerous with its molten lava resting on top, threatening everyone around it. It is still admirable that even in times like this, Filipinos and other nationalities continue to send help like donating goods to families in the evacuation centers. The local government continuously warn everyone to be cautious as the Mayon might explode like fireworks soon. Even though Mayon, looking like a mad beast, maybe an amazing spectacle to witness, let us not forget the danger that comes with it.